The fact of the matter is; this has been about one of the roughest, toughest Aprils I have ever seen. In talking with others, some who have seen a lot more Aprils than I, they agree. When we were in our pre-runoff stage, the snow in the valley was up to your waist, now that it’s (mostly) gone, flows are such that you are taking your life in your hands stepping into the river. it has been hard to keep the faith this Spring. The thing that keeps me holding on, is that the upper river (and general trout season) opens on Saturday. 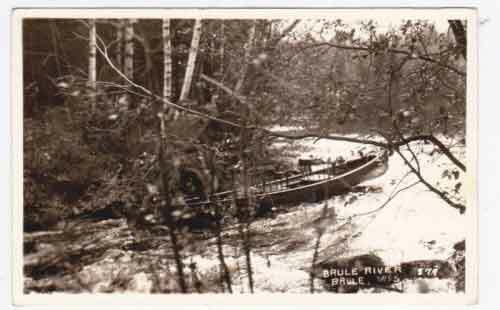 The thing about the Brule is that no matter how out of shape the lower river is, the river upstream always remains fishable. Not to say it always going to be great, but with Saturday comes a lot more options! Thank goodness. This entry was posted in Fishing Reports and tagged brown trout, brule river fishing report, fly by night guide service, steelhead by Damian Wilmot. Bookmark the permalink.